These draws come with the Mad Rock Ultralight biner. At a mere 30 grams, this is the lightest biner for its size and still rocks a full 25kN strength. Unlike other ultralight biners, which are compact in size, the Mad Rock Ultralight is larger and more usable. In fact, you might not notice that it's only slightly smaller than traditional full size biners, but rack up a set and you will certainly notice the huge difference in weight. 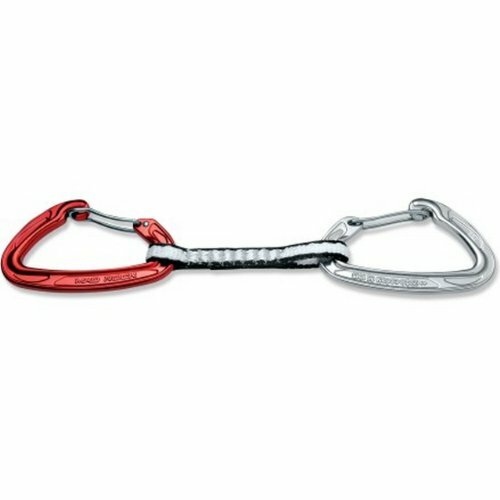 The latest design in forged I-beam construction, anodized finish for corrosion resistance, smooth gate operation, and incredible value make the Ultralight perhaps the ultimate carabiner and quickdraw, on the market. One of the lightest draws on the market. 4" x 10mm Dyneema quick draw adds strength while keeping the set light. If you have any questions about this product by Mad Rock, contact us by completing and submitting the form below. If you are looking for a specif part number, please include it with your message.